/ Achieve / Give Day was a success. Thank you! Give Day was a success. Thank you! The University of Lynchburg community worked together to make an incredible contribution to the future of LC and its students on April 6, 2016. The College’s first Give Day was more than a fundraiser; it was a fun celebration of community, family, and generosity. It demonstrated the way thousands of people believe in and support the LC community. 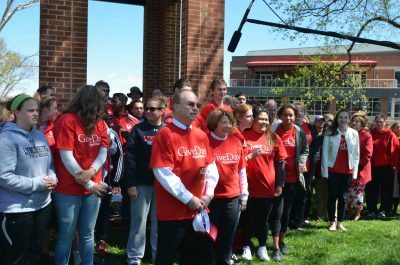 Give Day was planned after several supporters of University of Lynchburg offered to increase their pledges for the year by a total of $40,000 if the College would secure 1,000 individual donors in a single 24-hour period. Members of the LC staff and faculty planned a variety of events and messages to inspire the community to rise to the challenge. Throughout the day, the Lynchburg Hornets Sports Network shared live updates and interviewed campus community members to highlight how the day’s donations will support students. Some of the people interviewed had their own challenges. Coaches danced on Shellenberger Field to celebrate reaching 500 gifts. John Eccles, vice president and dean for student development, painted his beard red. Then he and his wife, A.J., climbed a tree, where he stayed up until an additional 220 gifts came in. The goal of 1,000 donors was crossed in the mid-afternoon, but donors kept calling and coming in. At 5 p.m., LC President Dr. Kenneth R. Garren was live on the Lynchburg Hornets Sports Network announcing that the gifts totaled 1,350 when he received late-breaking news: Additional donors had stepped forward and offered an additional $20,000 if the College reached 1,500 donors in the day. By the time the Give Day headquarters closed at the end of the day, the donor total had surpassed 1,700. That Friday, members of the community gathered to ring the Victory Bell to celebrate the accomplishment. Since then, members of the LC Advancement team spent many hours entering gifts into computerized records, making sure gifts were recorded and attributed to the correct donors, and tallying gifts from checks that were mailed on April 6. As of Monday, April 18, a total of 1,914 gifts were received. The money raised that day climbed over $163,000, including $60,000 in challenge gifts that inspired the giving.